The Red Sox closed out a 6-1 homestand with a 10-9 come-from-behind win over the Astros on Sunday afternoon at Fenway Park. Over the course of the seven games, Boston scored double-digit runs in five of them and averaged over ten runs per game. 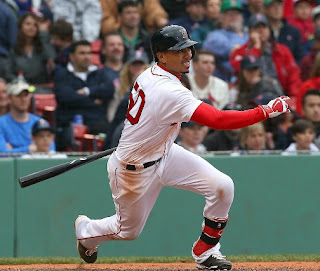 The Red Sox opened up a 2-0 lead in the bottom of the first inning courtesy of a Jason Castro throwing error and an RBI double by Hanley Ramirez, the first of his three hits on the day. Houston and Boston traded leads a few times, with the Astros taking advantage of an error by Josh Rutledge to plate three unearned runs with two outs in the top of the sixth and give them a 9-8 lead. The Red Sox took the lead for good in the bottom of the seventh in exciting fashion. With two out and a runner on second, Ryan Hanigan lifted a fly ball into right center that fell between Carlos Gomez and George Springer driving in Rutledge from first base. Mookie Betts (pictured) followed with an RBI triple to give the Red Sox the 10-9 lead. Craig Kimbrel recorded his tenth save of the year with a clean ninth inning striking out two of the three batters he faced. Sean O'Sullivan started for Boston. He went just 4.1 innings allowing six runs (five earned) on five hits and a pair of walks. He was designated for assignment after the game. Rutledge and Hanigan each had three hits; Jackie Bradley Jr. extended his hitting streak to twenty-one straight games. Xander Bogaerts hit his fourth home run of the year in the second.